Megastar Chiranjeevi is popularly known for his good deeds and kind personality. His good heart proved many times that he owns a lot of good traits than bad. 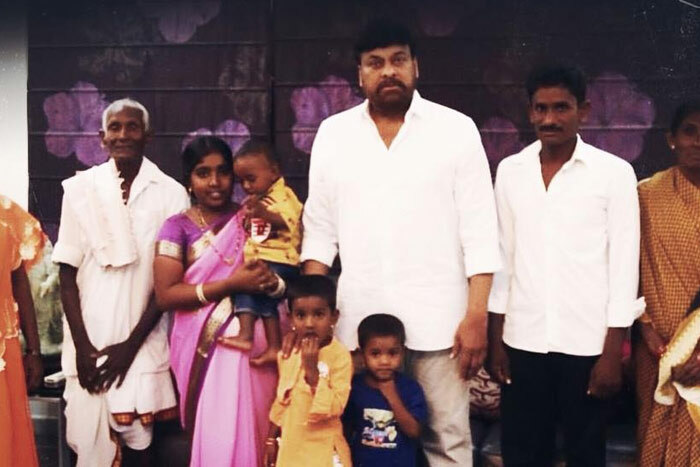 Though he has a seemingly limitless amount of money, Chiru never hesitates in helping strangers and his fans. The recent incident where the actor invited one of his ardent fans and his family members to his residence has now become the talk of the town. He said to have spoken to them amicably for about one hour. Chiru’s fan, Nakka Venkateshwara Rao, hails from the Godavari district and he said that he adores the Megastar ever since his childhood days. He also worked productively for Praja Rajyam party in the good olden days. Venkateshwara Rao also claimed that he was thrown out of his village for nearly five years on working for the party. Soon after knowing this, in 2009, Chiru has met him and helped him financially. Now, once again the actor met the fan over his request to name his newborn son. Chiranjeevi named Venkateshwara’s son as Pawan Shankar. This incident once again shows that Chiranjeevi cannot stop loving his brother Pawan Kalyan more than anything in the world. Hearing the news, Pawan fans got emotional and praised Chiru for his lovable gesture.